Here at the farm, we’re all breathing a lovely sigh – the kind that comes following months of hectic, hard work that abruptly comes to an end. The last packages have been loaded onto trucks. The conveyor belts have been silenced. 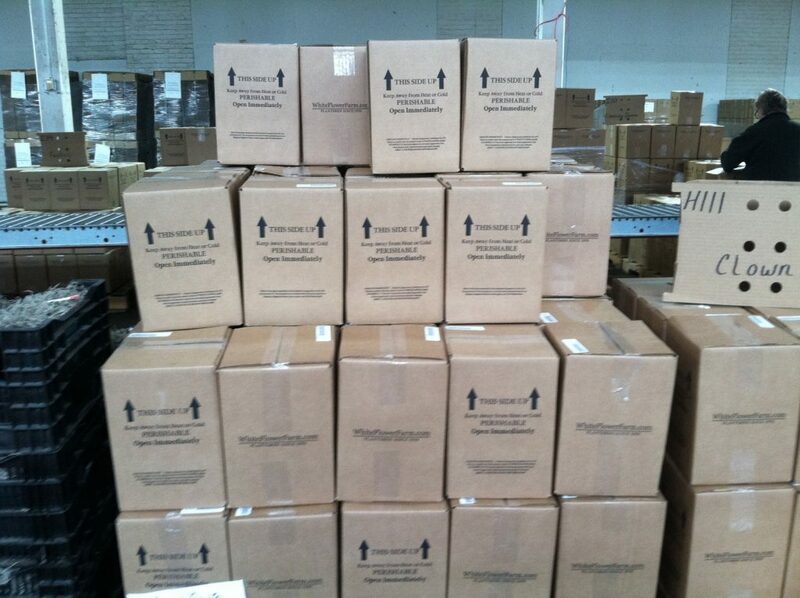 Members of the Shipping Department have all gone home for the holidays, and the rest of us are soon to follow. A festive mood prevails (a “hangover” from our somewhat raucous annual staff breakfast), and our hearts rejoice each time we hear employees warmly wishing one another “Merry Christmas!” and “Happy New Year!” as they depart for a few days, their arms laden with blooming azaleas, Christmas roses, and cyclamen. In the stillness that settles over the farm and the warehouse, we count our blessings. We’ve just wrapped up our 66th year in business on a high note. We work diligently at something we love, and we’re lucky to enjoy the enthusiastic support of loyal customers, many of whom first introduced themselves years ago as beginner gardeners and who have since become experts. Their holiday cards and letters hang in our Customer Service department. We’re also privileged to work with a growing number of new customers, many of whom are novice gardeners. They seek out White Flower Farm not just for plants and garden gear but also for advice, inspiration and horticultural information. Our greatest joy is in helping them succeed, thereby nurturing a next generation of gardeners. 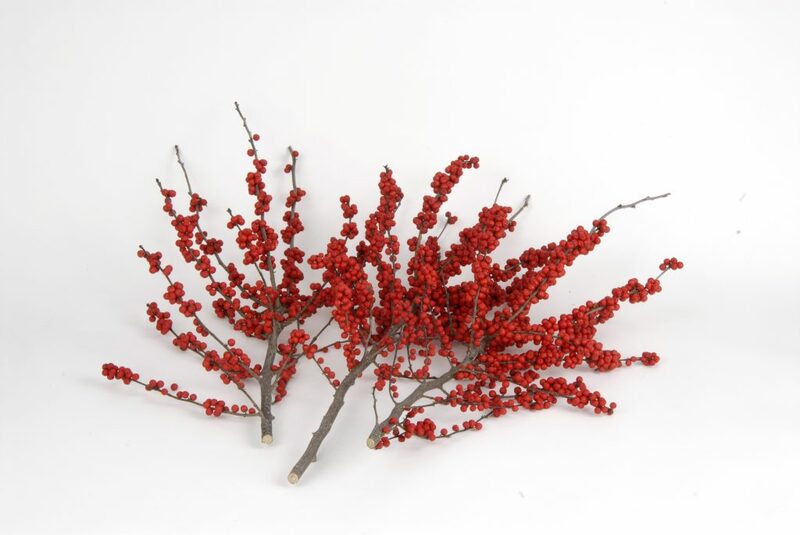 A trio of winterberry branches. The next “blessing” we count may sound a bit silly, but we’re grateful, quite simply, for plants – their beauty, their endless variety, and their resilience. In our greenhouses and garden beds, they astonish, delight and revitalize us each day. They ask remarkably little – water, soil, and varying amounts of sun – and they give a tremendous amount in return. Against a backdrop of tumultuous world events, the plants we grow in our gardens and in our homes provide tranquility. Each is a literal green oasis that reminds us of all the beauty there is to be found and cultivated in the world. From all of us at White Flower Farm, we wish you and yours a season of peace and joy, and a new year full of blossoms, beauty and possibilities. Please note: To give our hard-working staff some well-deserved time off, we’ll be closed from Dec. 24th through Dec. 26th. We reopen Dec. 27th and look forward to hearing from you. Rewind a few months back to early October . . . The tuberous begonias in our display house begin to show signs of fatigue after four hot summer months of blooming their heads off. I close the doors to the public for the season, and the plants, no longer in the spotlight, breathe a sigh of relief. Even though there is still some color radiating from the display, the flowers are smaller and sparse. Tinges of yellow are beginning to show up on previously lustrous green foliage. Both the plants and I are in agreement. We only want to be in the public eye when we are flaunting fantastic flowers and fresh foliage so as to not disappoint our visitors with a subpar show. As I close the doors, I applaud the performance of the begonias with a standing ovation. I couldn’t be happier with their splendid show in what seemed to be a hotter than normal summer. Now begins the process that leads to a well- deserved winter slumber. 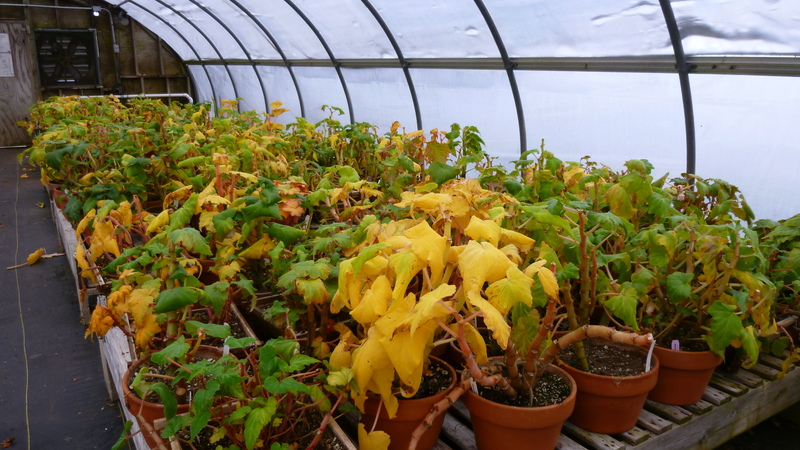 October and November are not stressful for the begonias. I turn down the thermostat in the greenhouse to near 45F. As the autumn temperatures outside start to dip, the plants respond. Flowers and foliage fade and begin to look dull. I check the plants weekly for watering needs, providing drinks for those plants with dry soil. I don’t force the dormancy issue. I let the plants go down on their own time. That’s important because the plants need time to prepare their tubers before sleep. Energy drains out of the leaves and stems back down to the tubers storing essential fuel for the next growing season. I do go through the plants and gently pinch out their growing tips. It only hurts for a second. New flowers keep being produced as the stem tip grows out. 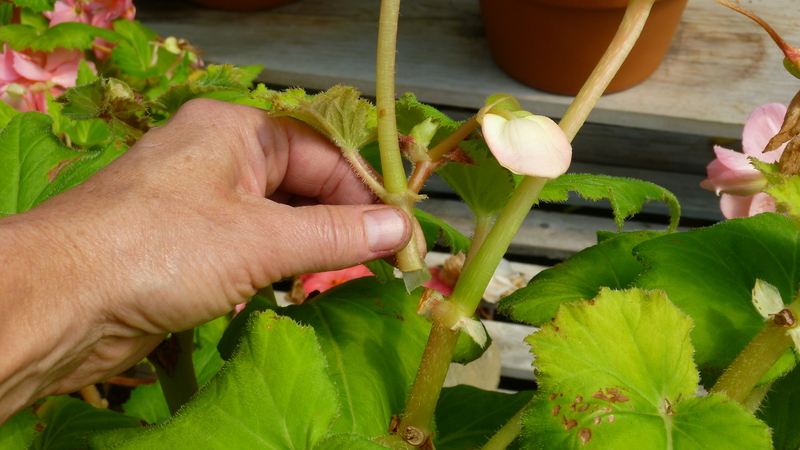 By pinching the tips, the plants no longer need to expend energy trying to make new flowers at this late date. 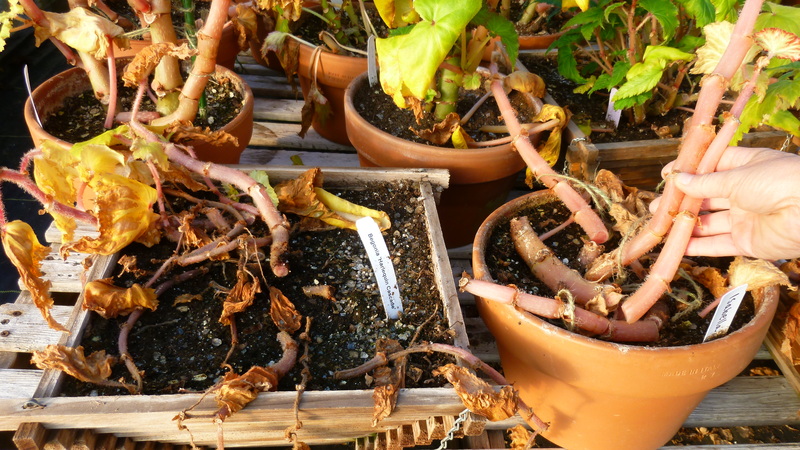 For several weeks, I see slow progress in the greenhouse toward that ultimate goal of dormancy. Then as the days get shorter I see dramatic changes. About the time in mid-November when I leave for work in the dark and return home in the dark, the plants are full speed ahead in the process. The foliage completely yellows and stems redden. I go through the plants once a week cleaning up fallen leaves and giving each stem a gentle tap. Stems that are ready to be removed fall over easily like trees being felled in the forest. 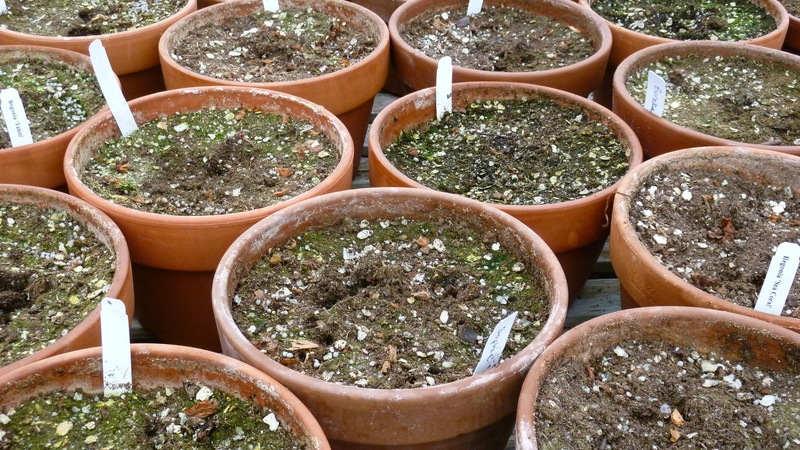 By early December, I’m left with what looks to the innocent bystander like just a bunch of soil-filled pots. It’s time to unpot those precious tubers that lie within. I knock each plant out of its pot and carefully unearth each tuber. I peel away the soil from the tuber and brush it off with my seasoned, soft paintbrush. I examine each tuber for soundness. Most are happy and healthy. Sometimes I find one or two that are soft and squishy and need to be discarded. It’s sad when that happens. 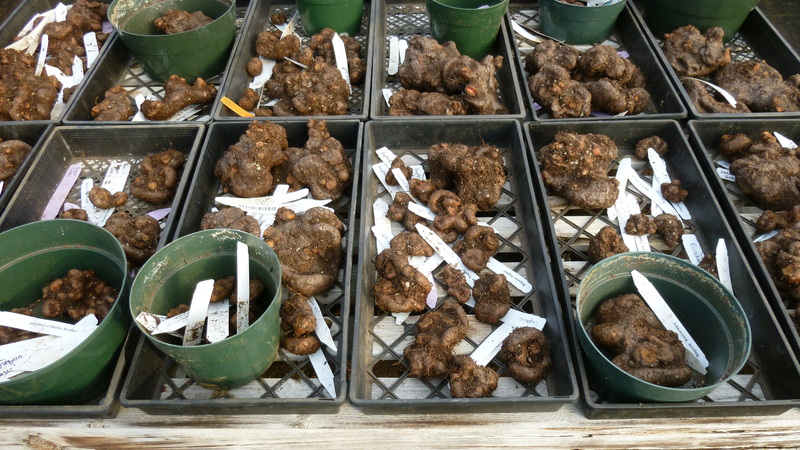 After their once-over health check, the tubers are placed in trays all sorted by variety. The sizes and shapes of the tubers are really quite variable and fun to look at! I turn the thermostat up to 50 degrees in the greenhouse while the tubers are exposed. They will sit out in the air for a week or so to cure before packing. I hesitate to put them to bed too moist for fear that winter rot might take hold. I do find myself compelled to cover the whole lot each evening with a tarp. It makes me feel better if not the tubers! The packing process is easy. After checking in for inventory roll call, each tuber is wrapped in a sheet of newsprint paper with the proper label tucked securely inside. 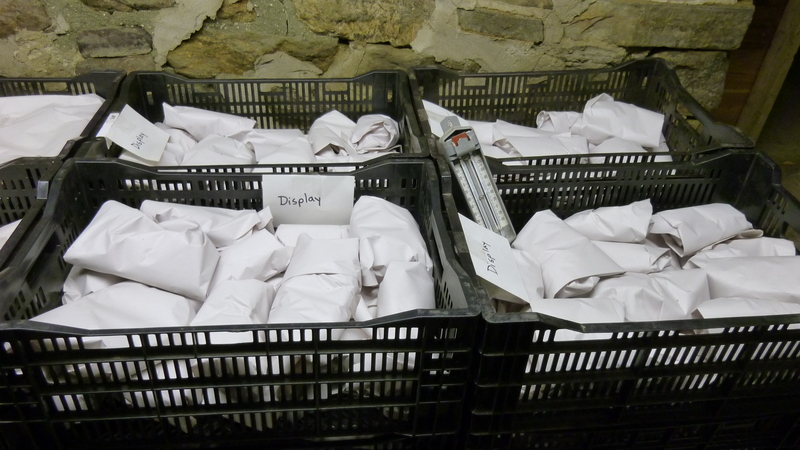 The precious paper packages are then gently laid in lily crates. The crates get shuffled off to the guest cottage dirt cellar where they are neatly stacked. The tubers settle in for their long winter’s nap. They rest . . . I rest. It won’t be long until St. Valentine’s Day, and we can do it all again!! Happy winter to all! Wrap ‘Em Up, and Ship ‘Em Out! You know how our Tabletop Trees arrive fully decorated and strung with lights? Here, members of our staff pack up the batteries we send with the trees. All hands on deck. 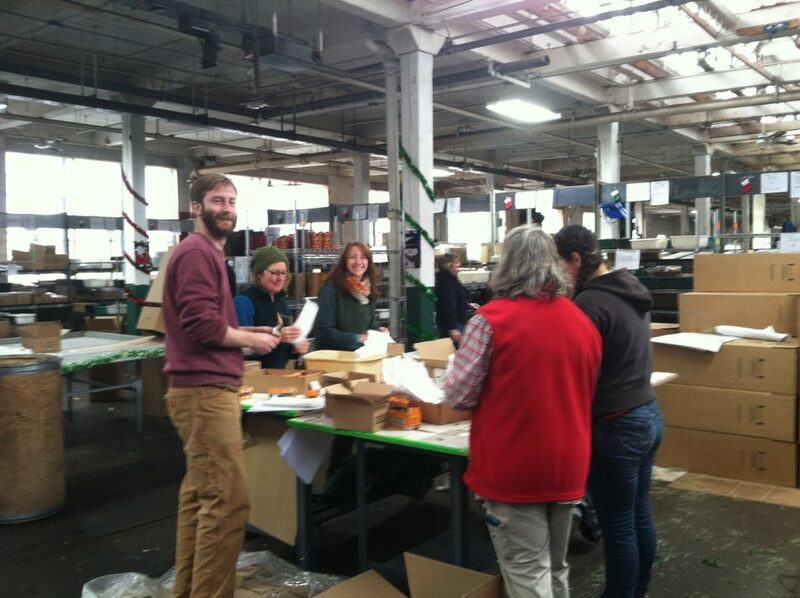 Members of our staff who work in Publications, Marketing, and Finance joined forces with the Shipping Crew to take advantage of a window of warm weather for shipping tender plants. 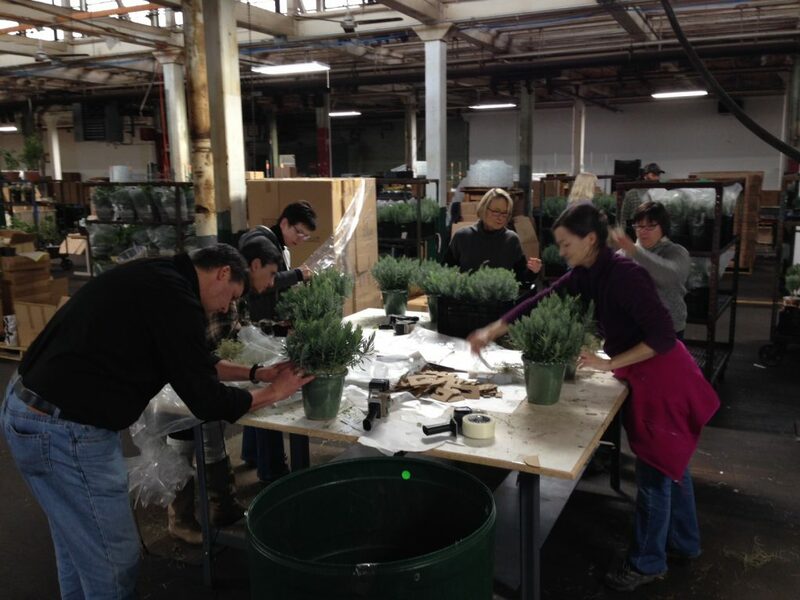 Here, our bushy, fragrant Lavender ‘Goodwin Creek Grey’ plants get packed for their travels. This year, a window opened on Dec. 12 and 13. Like a well-timed Christmas miracle from Jack Frost and his friend the Polar Vortex, daytime temperatures rose above freezing, and the call went out for “All hands on deck!” Almost the entire staff rallied, descending on the warehouse to help the Shipping Department get the plants packed, boxed, and onto the waiting trucks. 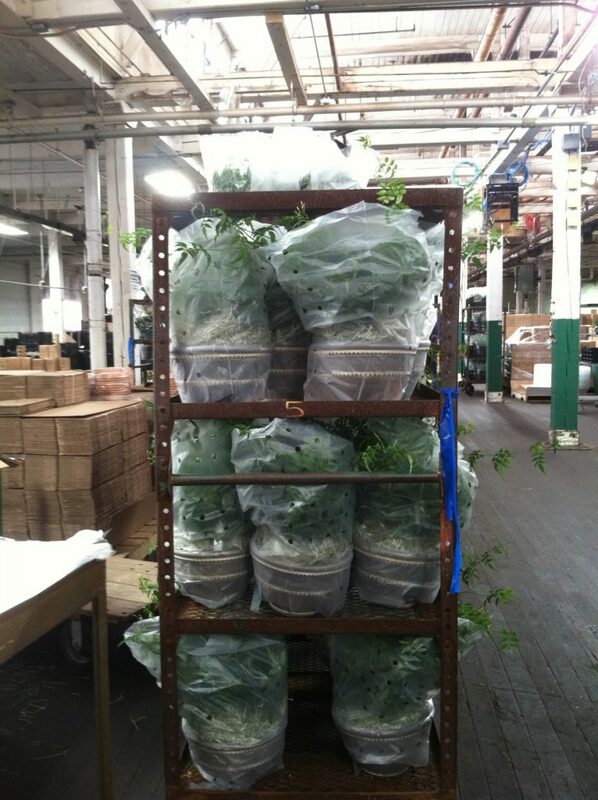 Beautiful Jasmine plants in Wrenthorpe Pancheons, bundled and wrapped in sleeves, waiting for boxes. Packing plants is a bit more complicated than, say, packing sweaters. Jasmine, lavender, holiday cactus, succulents, culinary herbs, azaleas, gardenias, and potted amaryllis, paperwhites and bulb gardens all need to be carefully secured inside their pots and then inside their boxes. 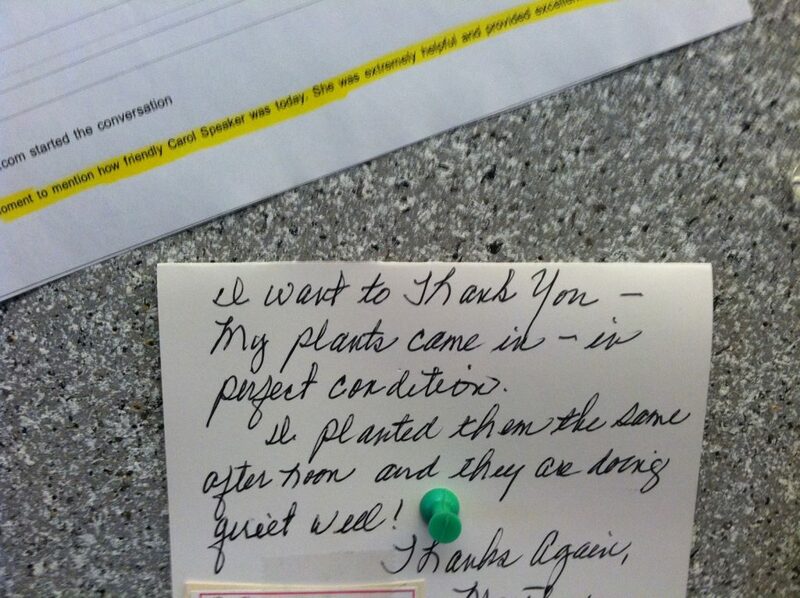 If the job isn’t done right, the customer receives a badly damaged plant amid a box full of loose dirt. So over the years, we’ve made a small science of packing and shipping our plants so they’ll arrive looking just the way they did when they left our greenhouses. To secure the soil or potting mix in each pot, we use a combination of specially sized die-cut cardboard pieces, packing paper, grass, cello tape, and/or plastic sleeves. The plants are then packed inside specially designed cardboard boxes so if, for instance, a carton containing a Topiary Azalea becomes part of a festive game of “football” at a shipping facility or if it’s accidentally dropped upside down by a driver or a recipient, the plant and pot both survive intact and show no traces of the mishaps. 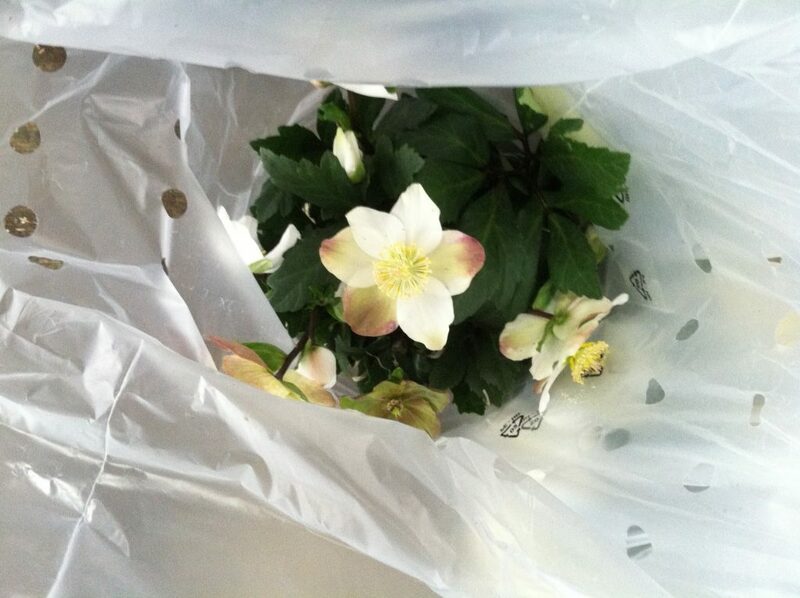 A Christmas Rose (Helleborus niger) wrapped in a plastic sleeve, waiting to be boxed. Part of the joy of packing plants is spending time with them before they leave. Those of us who work in the Marketing, Publications, Human Resources, and Finance departments don’t often enjoy the hours in the greenhouses that some of our colleagues do. So as we all stand around the packing tables, securing our charges for their journeys, we fall in love all over again with the soft, felted grey leaves of Lavender ‘Goodwin Creek Grey’; the intensely fragrant flowers of Jasmine polyanthum; the delicious scents of Golden Sage, Rosemary, and English Thyme in our Cook’s Herb Trio; the delicate but unstoppable blooms of the Christmas Rose (Helleborus niger); the dazzling color the Pink Topiary Azaleas; and the spiky forms of Aloes and Succulents. It’s easy to see how happy these plants will make someone when they’re discovered under the tree on Christmas Day or presented as part of any celebration. 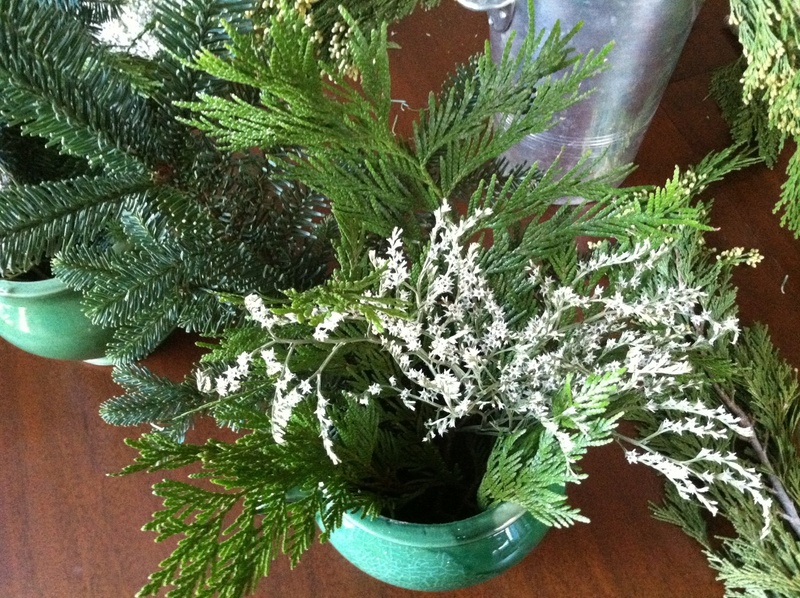 Imagining the happiness of our customers is a holiday gift to all of us at White Flower Farm. It’s a very large part of why we do what we do. Amaryllis ‘Clown’ packed and ready for shipping. Quick Decorating Ideas for the Holidays! 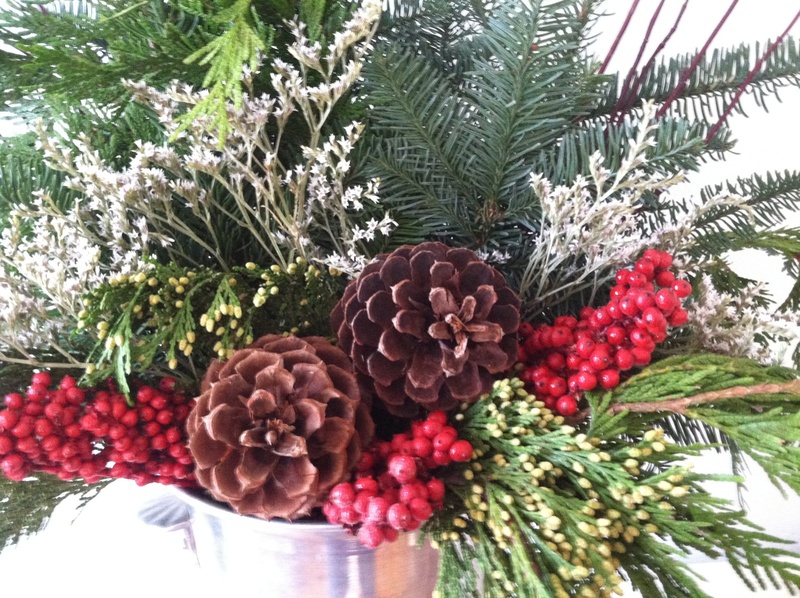 Need a couple of quick tips for decorating your home for the holidays? Think greens. 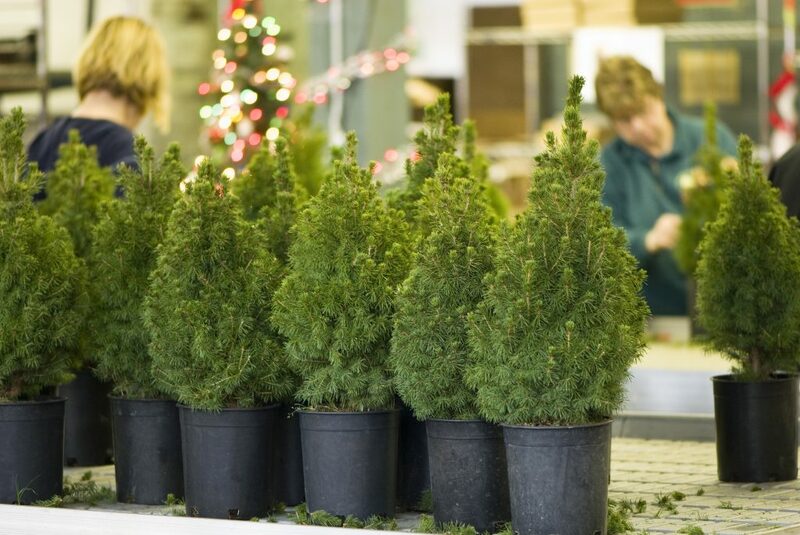 Step outside with a pair or pruners and take cuttings from evergreen trees, shrubs, and perennials (being careful to prune judiciously and not to offend any neighbors), or order a 7- or 14-lb box of our Decorating Greens. The key here is to amass an assortment of ingredients that come in a variety of colors, textures, and forms. 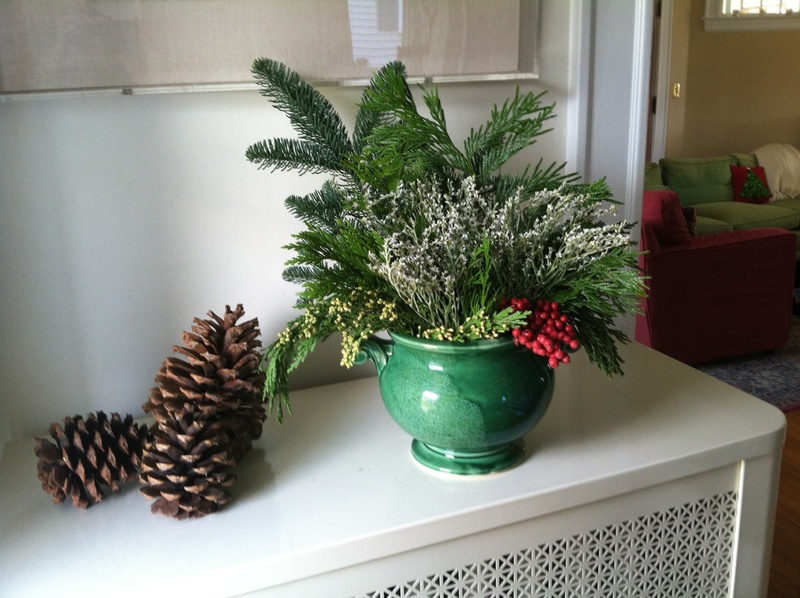 Here you can see the contents of a 7-lb Box of Decorating Greens from White Flower Farm. Spread out the collection of elements on a worktable or floor so you can see everything you’ve got to work with. Next, round up a few pots, cachepots or vases. Then, play. Generally speaking, it’s easiest to start by placing the largest and tallest elements in your pots and then filling in around them. 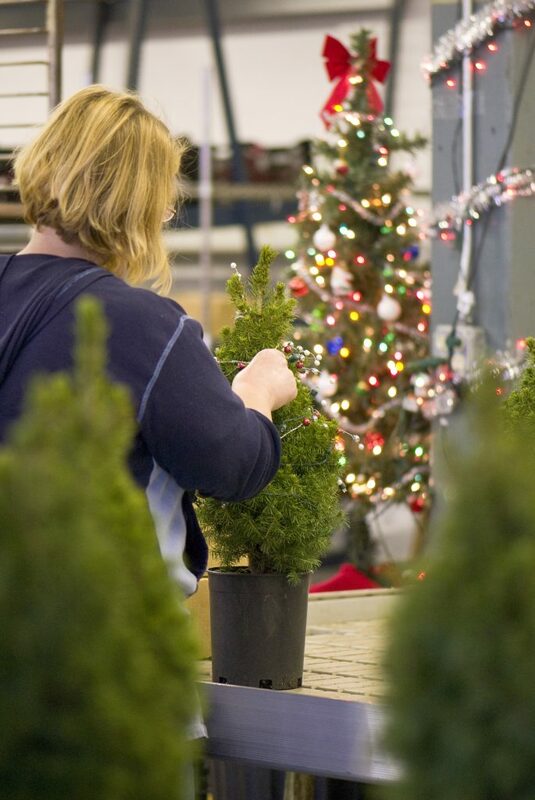 Trim and prune the greens as needed to fit your pots, and save the clippings to make other decorations. As you make your arrangements, keep in mind where you’ll be displaying them. If they’ll be on a mantel, with one side against a wall, there’s no need to fill in all the way around. But if your arrangement will be viewed from all sides, be sure to keep turning the pot as you go so all sides have a finished look. A small and festive accent just inside the front door. This is why it’s wonderful to have a mix of different colors, textures and forms. 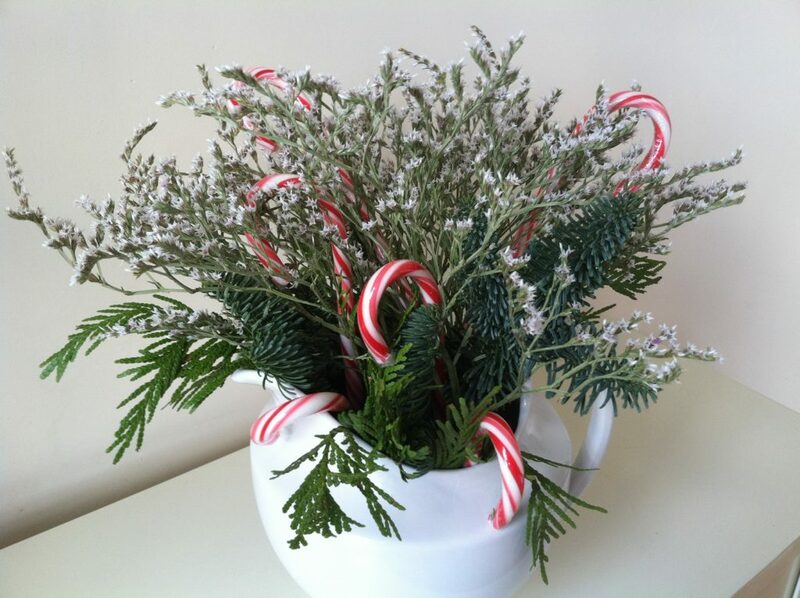 If you have any leftover greens or dried flowers, use your imagination and whatever you have on hand to create additional decorative arrangements. Use your imagination with leftover greens! Where greens aren’t the central element in your decorating scheme, they can be used to add a color to other adornments, including a wide variety of houseplants. One of our favorite things to do is mass a particular indoor plant in groups along a mantelpiece, atop a sideboard, or on an entrance table. Depending on the effect you’re going for, Azaleas, Gardenias, Lemon Cypress, Wintergreen, Holiday Cactus, Jasmine, and potted Hydrangea all work beautifully. 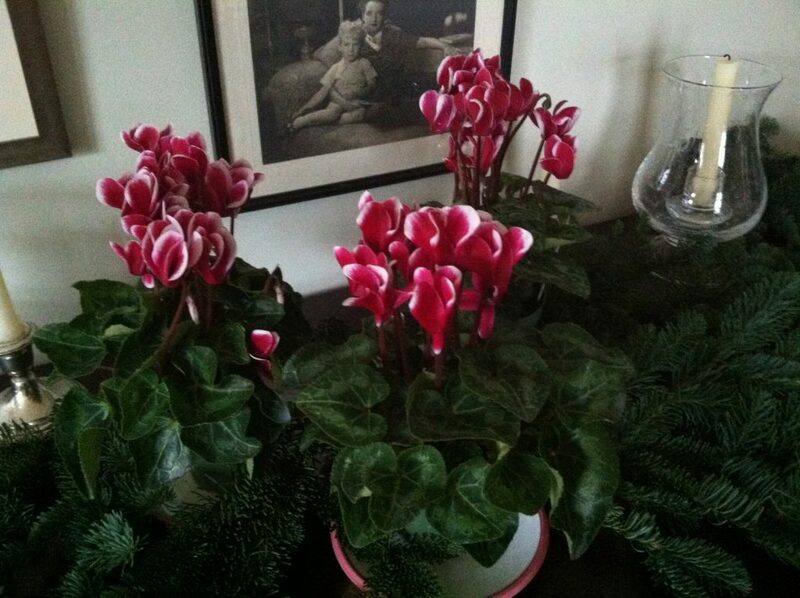 This year, we took home some of our new Cyclamen Fantasia® Deep Magenta to spruce things up for the holidays. 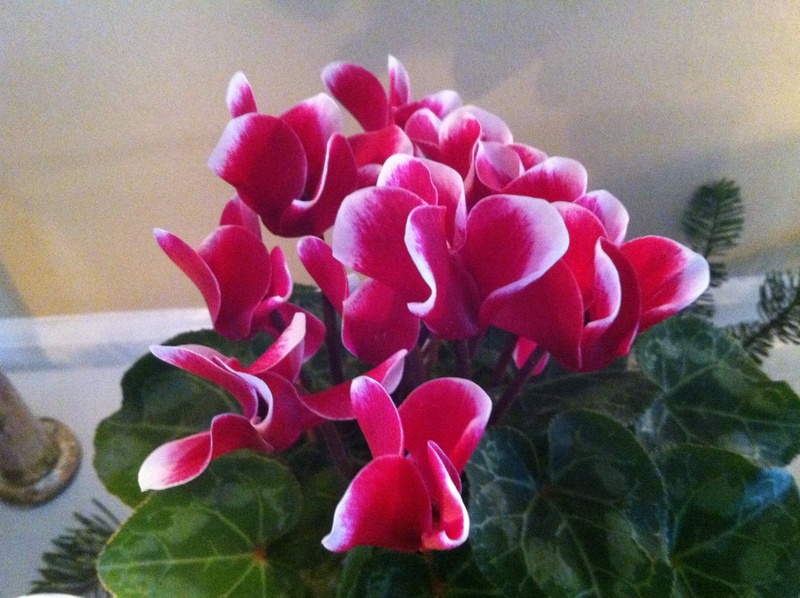 The rich, deep pink blossoms with white trim are a lovely and unexpected surprise. They’re attractive enough to stand alone, but to create a fuller effect, add some other simple elements, the sort most of us have around the house. 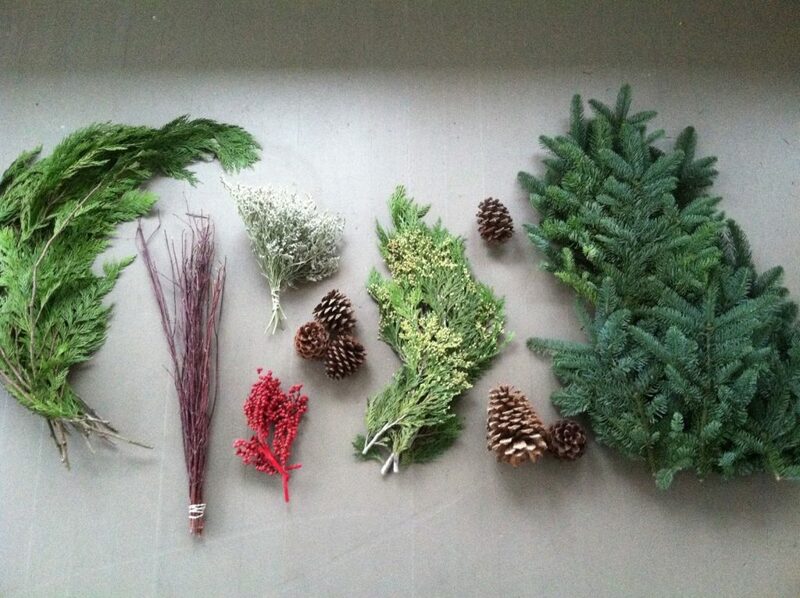 Here, we added candlesticks and votives, some clippings of Noble Fir left over from our box of Decorating Greens. 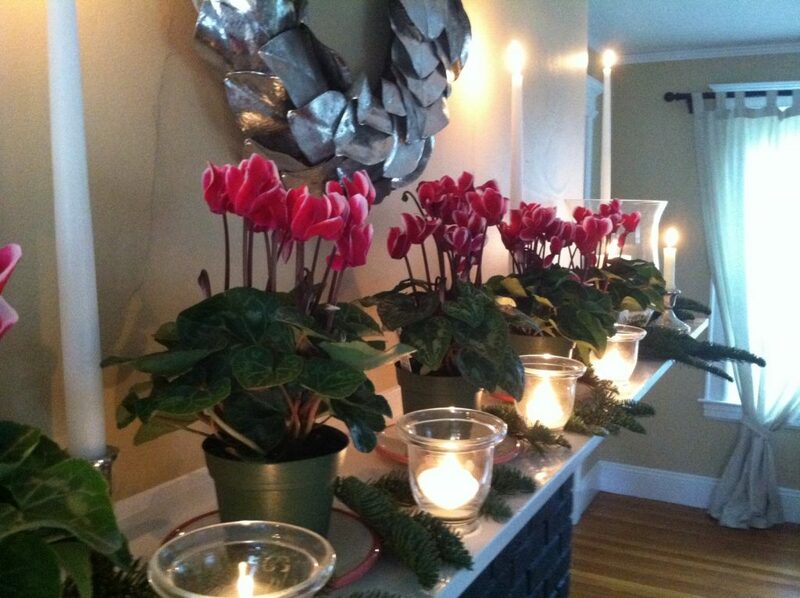 The silvery color of the candlesticks picks up the patterning in the beautifully veined leaves of the Cyclamen, and the candlelight makes the whole scene glow. We decked the mantel . . .
And the dining room sideboard . . . The best part? Our decorating took only an hour or two, leaving us plenty of time for other holiday preparations.